Serving areas: All of Dc, Baltimore, Maryland, and Virginia. Voted #1 in Kids Entertainment! Specializing in clowns, face painting, balloon twisting, costumed characters, puppet shows, magic shows, storytelling, concession rentals, moonbounces and more. We are a one stop shop for your event needs. Our (CEO) Oh! Day enjoys featuring all of his shows at birhtday parties, church events, family reunions, festivals and more! 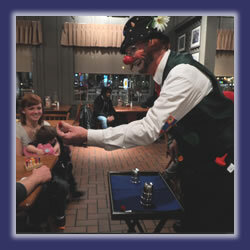 Leroy Is a is part time Clown He offers fun fill magic shows Balloon twisting comedy. Leroy is available weekends and evening. So if you are looking for your even to be filled with fun look no frothier. Hire Leroy to take care of all of your entertainment needs. Serving areas: Northern Va., Parts of Md. and Washington D.C.
We provide lots of family fun with funny interactive magic shows with a live bunny and balloon twisting with a Clown or Child friendly entertainer. Add some face painting and games and everyone has a great time. You can design your own party package. 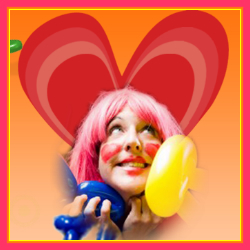 BEE BEE Clown, Kate McGlynn, is a professional children’s entertainer who has performed across the United States, in Canada, Hawaii, and all over Europe. From local birthday parties, to large events on stage and screen, Kate captivates her diverse audiences with wide variety of clowning, acro-balance, creative and empowering activity learning, and so much more. 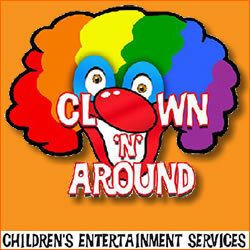 Call 240-355-0988 or visit www.BEEBEEClown.com for more info. 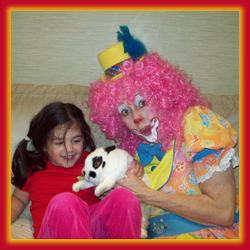 Auntie Streamer is a professional clown performer serving the Washington DC metro area and surrounding. A delight with “children of all ages,” Auntie Streamer is ready to perform for you at Parties, Festivals, Grand Openings, Church Events, hospitals, senior citizen homes, and other special events. Along with Clown entertainment, Auntie Streamer provides professional face painting, balloon animals, story telling services, and puppet shows. Call Auntie Streamer today or visit the website for more info.